Join Australia's best quality share market social network to discuss - BLACKHAM RESOURCES LIMITED and other ASX listed companies. I just got poll axed today on Blackham Resources. I thought I'd done all the background research, including speaking with the Investor Relations Manager only a month ago, who confirmed everything was going well after an excellent 1st quarter. Their production report today shows that whilst production was still strong, All In Sustainable Costs have increased significantly (above $1,500)- that was the one thing he neglected to tell me. He was very sincere when I spoke with him and genuinely felt the company was performing well. So- share price has fallen 16% and I'm out. I took the loss and the pain- and believe me, it is very painful. I called the investor relations manager of Blackham Resources today to ask for his view on why the share price hadn't been responding to a great last quarter by the company and the latest drilling update. This is a company thats been confounding me, because at only $88 million market cap, it seems dirt cheap. See my previous posts which contain my reasons why I think this, by typing Blackham in the search bar. Apparently, there's still a lot of distrust for this company, which has fallen from $1.00 to current price of 6.9 cents as a result of poor management. 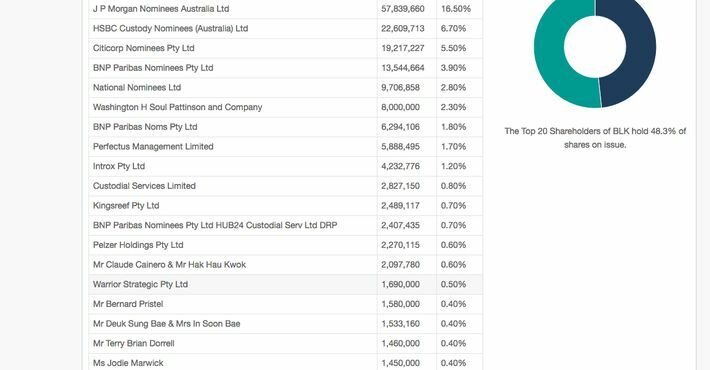 This led to a the company being suspended from the ASX, followed by a major recapitalisation at the beginning of the year to repay and restructure debt. This was before I ever looked at the company, so I don't know the gory details. With the value destruction previous shareholders have endured, I can understand why people might be gun shy about getting into the stock. That said, the best opportunities in the stock market often arise when others are fearful. The investor relations manager believes the market might be waiting to see more evidence that the turnaround seen in the first quarter is sustainable. The next quarterly will be released in July some time. 1. Nuheara (NUH): I was pleased to see the shares close up 4.55% to 11.5 cents following the completion of a $6 million capital raise on Thursday at 9.5 cents. I felt the share price wasn't going to go anywhere until the company raised money and now that it has, I'm hoping it might rise. Today was a good sign, but it may well be that the market wants a sales update before its willing to push the price higher. On the face of things the company is executing well. It recently entered Japan, having previously entered the US and European markets and it now has funding. 2. Blackham Resources (BKL): This came out with an announcement today that drilling results have strongly supported the potential for the continuation of underground mining at its high grade Golden Age orebody. In addition the article below in the West Australian talks about the company producing $1.5 million of gold every four days and looking to hire people to expand its operations. I honestly don't know what I'm missing on this one. I left a message for the investor relations manager, but he didn't call me back. Will try again tomorrow. 3. Shriro Holdings (SHM). This share was smashed around a month ago. It fell from ~$1.40 to $1.00 due to a trading update that showed trading was challenging for its kitchen appliances business. The $1.00 price represented a p/e multiple of ~6.0x and franked dividend yield of 11%. Whilst I realise the business is in a competitive space, it's very rare to find companies trading at 6x p/e, producing cash that allows the payout of an 11% dividend and with a balance sheet that is almost debt free. Since it has fallen it has gradually recovered, today reaching $1.27 and closing at $1.225. What has been interesting about the recovery from $1.00 through to todays closing price has been the thin trading, with hardly any sellers on the screen and lots of buyers. I'm a bit worried that someone with a smallish holding is pumping the stock (hence the small volumes driving the price up), but its done well for me. 4. Axesstoday (AXL): This share is a thinly traded stock that has fallen all the way back to a close of $2.09 today off small volumes. It had risen to over $2.40 a week or so ago. I'm thinking about buying more, because (as I've posted previously) they have a perfectly credentialed management team for what they do, are disrupting the incumbent competition and have been executing very well. I also read that they presented at Shaw and Partners brokerage today and are held by Perennial Value in their micro cap fund. They were also spoken highly of in Livewire markets. So the institutional sentiment around this stock is good and as long as they keep delivering, I reckon the share price will move higher in the long term. 5.Qantas (QAN): This closed at $6.57 today and seems to be moving up. I got in around a week ago at $6.40 off the back of Regal Funds Managements presentation at a conference. I did a post on this a couple of weeks ago (you can find it by searching for Qantas in the search bar) which outlined a number of good reasons why Regal thought the stock was undervalued. I like the fact Qantas is buying back their shares, as this means they believe they're cheap. In addition, with less shares on issue, it will also underwrite a stronger earnings per share growth profile. Please note that the views I've expressed above are my personal opinion. Whilst I could be right in my assessment, I could also be entirely wrong. You should always do your own research. I'd also love anyone else thoughts, particularly if they disagree. Found this interview with the CEO of Blackham Resources. Must have been done in November last year. At 7 cents a share and a market cap of only $88 million, I cannot see what I'm missing with this one. I hold a small parcel of Blackham Resources as a gold speccie. What I love about the company is it only has a market capitalisation of $88 million, yet its current monthly production puts it on an annual production run rate of just under 100,000oz per annum, it has a low cost of production and is generating a high margin on the current gold price. It therefore seems very cheap to me as previous companies i've followed with these fundamentals have typically had a much larger market cap. Terrific March 18 quarterly activities and cashflow report released by $BLK today. Price up 6.8% at the moment- wondering why it fell so sharply last week in the first place?? For anyone whose following BLK today, I just called the Investor Relations Manager of the company to ask why he thinks the price has fallen to the extent it has. He said they are all as surprised as everyone else, because the announcement set out very clearly that the company is excelling in every key metric. Announcement of a record quarter of gold production- 7,419oz for the month of March, representing an annualized run rate of 89,000oz. In addition, all in sustaining costs for the quarter were only $1,092 per oz- down 42% on the last quarter and BLK's average realised gold price on sales for the quarter was $1,669/oz. They have a strong balance sheet with only $11m of net debt and have confirmed production guidance for the half of 40,000 to 45,000 ozs. In my view, this is a terrific announcement, yet the share price is currently down 10%. I suspect its because the whole market is down following the sharp falls on Wall St on Friday. On any other day and I reckon BLK would be up 10%. 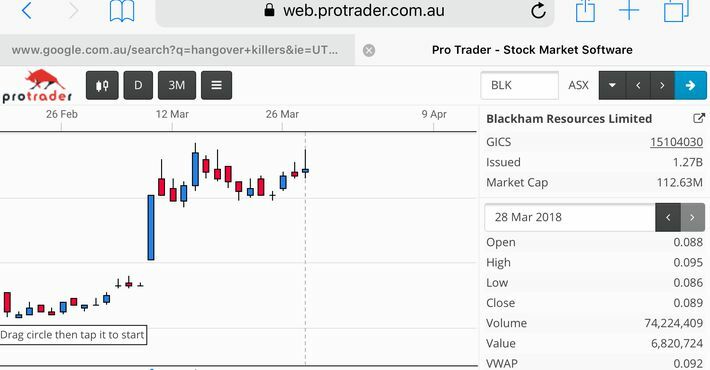 I think the sell off is purely sentiment driven and probably a good buying opportunity, given that at current price, BLK's market cap is only $119m, which is pretty small in my experience for a company with production approaching 100,000 per annum. Just my opinion- so, if anyone thinks otherwise please let me know as I don't enjoy seeing the price being smashed (and maybe there's something I've missed?). I reckon its just a large retail register whose stop losses are getting hit causing them to bail, that's causing the downward slide.